North Carolina DUI laws are fairly unique in the United States, compared to how other states handle DWI-DUI charges. Like federal sentencing guidelines, the NC DWI laws on sentencing are complex, at times confusing, subject to some amount of interpretation. Sentencing in North Carolina is correlated to whatever “level” of punishment state DWI laws mandate. No other states’ driving under the influence laws set forth minimum, mandatory punishment for its DWI (driving while intoxicated) statute in the exact same manner or legal framework as the NC DWI laws. Compared to many other states’ drunk driving statutes (i.e., Missouri DWI laws, Mississippi DUI laws, Nebraska DUI law), North Carolina DWI laws are among the nation’s toughest. At stake on DUI-DWI sentencing in the Tar Heel State are issues of jail time and, (if limited driving privileges are possible with an interlock device), probation, court costs, and possible alcohol or drug treatment. 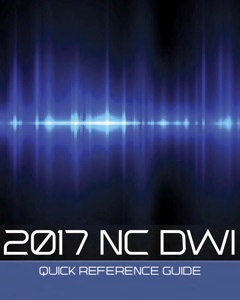 With six, structured sets of misdemeanor NC DWI levels, with Level A1 being the toughest, and an additional Felony DWI for Habitual Driving While Impaired in North Carolina, the accused citizen’s prior criminal history (related to DWI-DUI charges) and the circumstances and conduct of the arrested person during the arrest can escalate punishment. Any other aggravating factors in the DWI-DUI case, or “Any other factor that aggravates the seriousness of the offense” such as bad conduct toward the police officer or obstruction of a law enforcement officer. FOR A COMPLETE LIST OF ALL THE AGGRAVATING AND GROSSLY AGGRAVATING FACTORS USED IN DWI SENTENCING IN NORTH CAROLINA, CHECK OUT OUR NC DWI QUICK REFERENCE GUIDE. In addition, unlike many other states (e.g., California, West Virginia, Mississippi and Alabama – for youthful offenders) that offer ways to expunge or divert a first offense DUI, North Carolina DUI laws lack any such favorable alternatives. Experienced criminal defense attorneys in North Carolina, particularly lawyers who handle NC DWI cases, understand there is no way to obtain a DWI expungement. Relief from a prior conviction of DWI-DUI in NC is NOT available. Similar laws in Georgia, Alabama, Florida, Tennessee and South Carolina also may not allow for expungement of a DUI. What Is a DWI in North Carolina? Operating a motor vehicle in North Carolina while being impaired, by alcohol or by drugs, is enough to sustain a conviction. Driving while impaired is NOT the same thing as drunk driving in North Carolina. “Impaired” only means noticeable or appreciable. The odor of alcohol, by itself, also does not make someone “impaired.” At the same time, the prosecutor does not have to prove the person charged with DUI-DWI in North Carolina was “drunk.” Being drunk normally would mean that a person’s mental or physical faculties are “materially impaired.” That “effect” of alcohol in DWI cases must be “appreciable” which means it is sufficient to be recognized and estimated, in order to be convicted of DWI in NC. Police officers can testify (or show a police video of the accused citizen at trial) of the manner of bad driving, manifestations of a drunken driver and any results of voluntary field sobriety test performance by the detained driver, to make out the driving while intoxicated case, even without an implied consent test. In addition, for DWI by alcohol, any driver with an illegal BAC (blood alcohol concentration) of 0.08 grams percent or more can be convicted even if he or she looks totally sober. It’s up to the judge or jury, depending on the type of trial, to determine whether than BAC reading is reliable. It is not automatic. If it were, we wouldn’t need the jury system in NC. Otherwise you could be convicted of DWI in NC at the jailhouse without Due Process of Law or consideration of your Constitutional Rights. Plus, in North Carolina, the 12 person jury need not all agree to one type of NC DWI over the other, so long as all twelve jurors vote that the driver was one or both types of intoxicated driver. When a person blows over the legal limit or has a DUI blood test result of .08 or higher, the driver will most likely suffer a 30-day license suspension, as part of NC DUI laws. 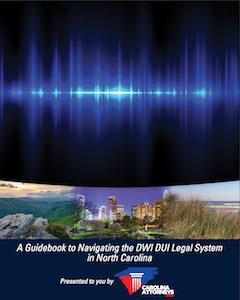 CHECK OUT THE NC DWI LAWS REGARDING IMMEDIATE CIVIL LICENSE REVOCATIONS FOR PERSONS CHARGED WITH IMPLIED-CONSENT OFFENSES IN OUR NC DWI QUICK REFERENCE GUIDE. SEE THE SECTION ON N.C.G.S. 20-16.5. A NC DWI can be a misdemeanor or felony, depending on valid prior convictions for DUI-DWI in any state. With NC DWI sentences the courts also consider grossly aggravating and aggravating factors such as causing bodily injury in a DWI-related car accident. Like most states, NC ramps up the criminal charges to a DWI felony when there a multiple convictions for drunk driving over a certain number of years. 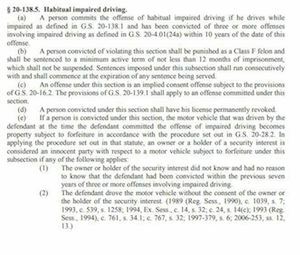 (a) A person commits the offense of habitual impaired driving if he drives while impaired as defined in G.S. 20-138.1 and has been convicted of three or more offenses involving impaired driving as defined in G.S. 20-4.01(24a) within 10 years of the date of this offense. Other felony charges related to DUI-DWI in NC exist for egregious situations where there is a fatality involved. The State of North Carolina has a very tough felony DUI law, wherein a third DUI in 7 years constitutes a felony. Unlike other states like Georgia, which uses dates of arrest of all offenses to measure who is a repeat offender, North Carolina utilizes this system: Date of conviction of the prior first DUI offense case, to date of arrest of the most recent and potentially 3rd DWI in NC. This pro-prosecution method of measuring time was enacted by the North Carolina Legislature to snare many unsuspecting drinking drivers who face Level I aggravated DUI punishment, for a possible DUI felony. N.C.G.S. 20-138.5 also appears to INCLUDE Canadian convictions for offenses involving impaired driving. By adding up mitigating factors and similar facts in aggravation of a possible sentence (e.g., a bad driving record), the Courts conduct a special DWI Sentencing Hearing to weigh the Aggravating and Mitigating factors. The Court is given some discretion with grossly aggravating factors, but the DWI sentence imposed is intended to be more harsh. All grossly aggravating and aggravating factors must be proven to the standard Beyond a Reasonable Doubt by the state prosecutor. All mitigating factors must be proven by the accused (the DWI defendant) to the standard of the Greater Weight of the Evidence or “more likely than not” as true. Even though they do not have the burden of proof, the DWI defense attorney for a person convicted of a DWI in NC argues for a sentence reduction or more minimum sentence imposed by the Judge by analyzing the NC DWI levels for the sentencing court and pointing out the strengths and weaknesses of each. Under the NC DWI levels, the DWI Level 5 punishment is the least severe. North Carolina DWI sentences are different than many states that have things like “DWI first offense” or “DUI first.” While having no prior DWI conviction is good, that is NOT the main focus of the court. In fact, even for a first offense DWI-DUI charge, an active prison term is possible when a child under the age of 18 is in the vehicle. DWI sentences in North Carolina can be tough. Even for a DUI in North Carolina for the lowest level or Level 5 punishment the Judge can assess a fine up to 200 dollars, plus surcharges, with minimum jail time of 24 hours to 60 days, along with community service hours, probation and a driver’s license suspension. 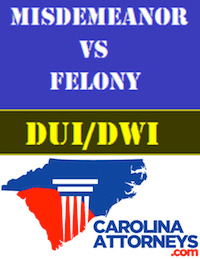 There also is a Special DWI Assessment Fee of $100 for all cases with a DWI conviction in NC. (That’s different from and in addition to any other fees or costs associated with obtaining an alcohol assessment from a properly licensed / authorized provider in North Carolina.) PLEASE NOTE: AN ACTIVE JAIL TERM IS NOT REQUIRED FOR LEVEL 3, LEVEL 4, OR LEVEL 5 DWI SENTENCES IN NC. The Court MAY impose the minimum active term in each level (72, 48 or 24 hours respectively), but in many, if not most, instances the Court imposes the condition of COMMUNITY SERVICE instead of an active term. IF YOU FAIL TO COMPLY WITH THE COURT ORDER OR JUDGMENT, that suspended sentence can be revoked and the ACTIVE TERM imposed. DWI SENTENCING IN NORTH CAROLINA IS NOTORIOUSLY COMPLICATED. 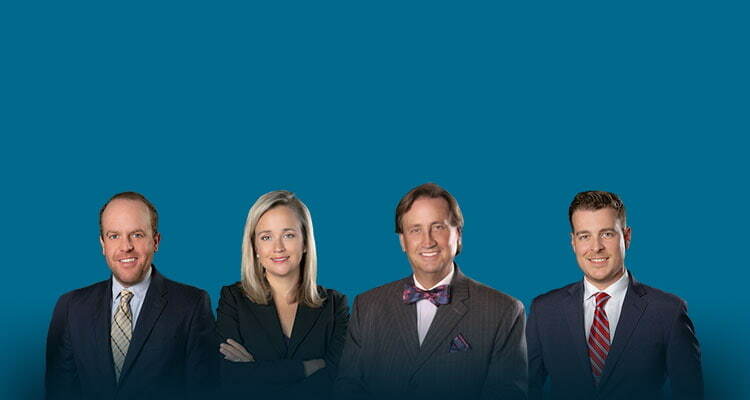 If you have questions it makes sense to talk to an experienced NC DWI lawyer without delay. Generally speaking, clients normally want to avoid a license suspension and do not want to see their licenses revoked for a breathalyzer refusal under DWI laws in North Carolina. Sometimes that is possible. Other times there is no way to avoid a suspension, depending on the facts of the case. It’s not hard to understand almost all drivers facing a DWI-DUI in NC want license reinstatement as early as possible. People need to drive to work, to take care of their families and to even support themselves. That’s why they’re often SHOCKED when they see how harsh some of the DWI laws in NC are. These clients rely on their DWI lawyer for knowing the various ways to protect driving privileges, or obtain limited driving privileges, if possible, and when an ignition interlock device is required to do so. EACH CASE IS DIFFERENT. CONSULT WITH AN EXPERIENCED LAWYER IMMEDIATELY. For answers to your additional questions regarding DWI (driving while impaired) offenses**, including interpreting the NC DWI levels, sentencing practices in Court, and DWI arrest procedures, please contact Bill Powers directly at: 704-342-HELP (4357). Powers Law Firm PA offers initial, confidential lawyer consultations, FREE of charge, for offenses involving DWI or DUI or any other felony or misdemeanor crimes in North Carolina. **People use the terms DWI, DUI and drunk driving interchangeably. There are technically differences and as stated the laws in North Carolina for DWI does not require drunk driving. So it doesn’t matter if you searched Google using DUI lawyer or DWI attorney or drunk driving lawyer, we understand what you mean. More importantly, if you call, we will take the time to explain the NC DWI laws to you, making certain to point out the differences between driving while intoxicated vs. driving under the influence or even misdemeanor vs. felony charges in North Carolina.